Xi Jinping, a politically daring, economically cautious, Chinese leader is certain to win a second five-year term at the 19th Party Congress, but his harsh line against his opponents, and his timidity on the economy, may come back to haunt him in his second term. Xi Jinping is China’s most disciplined and powerful leader in a generation, and faces no visible obstacles to his standing heading into the 19th Party Congress. Xi’s influence is most obvious within the party itself, in the way he has centralised power in his office and within Chinese Communist Party departments, notably the propaganda and anti-corruption bureaus. Xi has been a cautious steward of the economy, by contrast, shoring up state firms, and increasing the government’s hold over the private sector. Xi Jinping is China’s most decisive, disciplined leader in a generation, leading a country that is fast approaching military and economic parity in Asia with the region’s long-standing dominant power, the United States. Xi has swept aside potential rivals at home, re-established the primacy of the Communist Party in all realms of politics and civil society, and run the most far-reaching anti-corruption campaign in the history of the People’s Republic. But on the economy, Xi has been a cautious steward of the existing order, strengthening the state sector and extending political controls into the country’s thriving private businesses. Xi is certain to win a second five-year term at the 19th Congress of the Chinese Communist Party which opens on 18 October in Beijing. But his harsh line against his opponents, and his timidity on the economy, may come back to haunt him in his second term. It is one of the seeming paradoxes of modern China that as the country has become richer and its economy more globally integrated, its politics have become less liberal. It is a trend that has accelerated under Xi Jinping since he was named head of the ruling Communist Party in late 2012. All the signs are that Xi will entrench China’s illiberal bent with his reappointment for a second five-year term as general secretary in October, at the party’s 19th Party Congress in Beijing. More than any of his predecessors since China’s opening to the world in the late 1970s, Xi has focused ruthlessly on rearming the Chinese Communist Party (CCP) with the tools to maintain control of the country and perpetuate its 70-plus years in power. Xi has centralised decision-making in his personal office, pushing aside the cabinet and its ministers who in the past were crucial to policy execution in China. He has purged a legion of once powerful comrades and their families, with the most far-reaching anti-corruption campaign targeting the party’s senior ranks since the founding of the People’s Republic of China in 1949. He has pulled the military and state security firmly under his control. Xi’s strictures have also been on display in the strangulation of legal and political activism, and civil society more generally. Through Chinese eyes, a crackdown on dissent alongside rising prosperity may be no paradox at all. As China gets wealthier, the CCP needs to become more, not less, alert to the dangers of organised political dissent to single-party rule. According to this argument, China’s success is the proximate cause of Xi’s political tightening. In that respect, it wouldn’t be the first time that China has turned conventional Western expectations on their head. A more cogent explanation for China’s hardening political repression, however, lies in Xi himself. Xi’s record reflects both his ideological mindset and governing aims. Far from being at odds with China’s success, Xi see his re-enforcement of the party’s right to rule as the only way to ensure the country maintains its momentum. By definition, then, a leader committed to re-anchoring Communist Party rule must start by eliminating, intimidating, co-opting or marginalising potential rival centres of power within the leadership, the government, the economy, and society more broadly. In the short term, Xi’s approach has worked. Chinese leaders since Mao Zedong have always had identifiable competitors among their senior colleagues. Near the end of his first five-year term, Xi has none. Likewise, it is the party that is firmly in control of China’s direction under Xi’s leadership — not the state nor the military, and neither, for the moment, the most powerful actor outside of the governing institutions, the market. On foreign policy, Xi displays a similar sense of urgency and purpose. More than his predecessors, Xi has tried to leverage China’s diplomatic and military strength to press Beijing’s territorial claims in the East China and South China Seas, and lock in the country’s interests on its western flank. He has exploited a strategic opportunity in Asia opened by the Obama administration’s caution and now the instability and disorder of the Trump administration. He has launched an ambitious expansion of China’s global economic footprint, establishing new institutions, such as the Asian Infrastructure Investment Bank, and the billion-dollar Belt and Road Initiative, to transform the Eurasian continent into a China-friendly strategic and commercial hinterland. Xi has worked hard to build closer ties with Europe, especially Germany. He has intensified a strategic partnership with President Vladimir Putin in Russia, which both allows Beijing to keep Washington further off balance and exploit Moscow’s weakness as it struggles with sanctions and low oil prices. Xi is also leveraging China’s growing economic clout in Asia to pull countries such as Cambodia and Laos, and recently Thailand and the Philippines, into Beijing’s orbit. The decades-old canon of CCP foreign policy — of non-interference in the affairs of other states — is falling away. 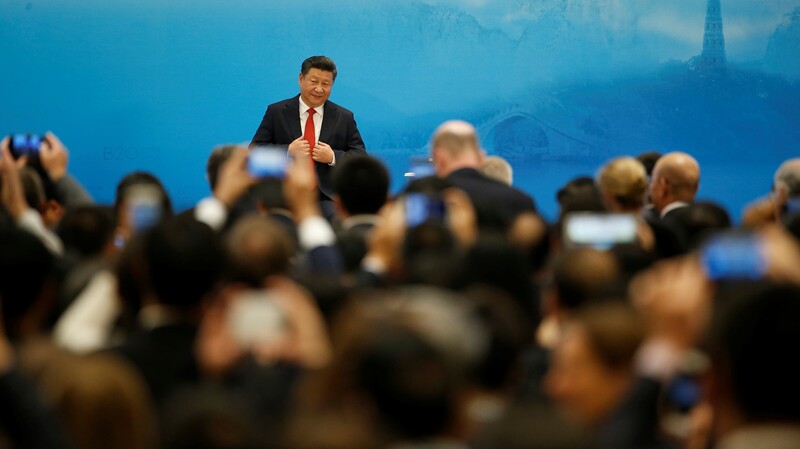 Dressed up in the benign slogan of the ‘China Dream’, Xi’s strengthening of the party at home and his determination to press Beijing’s claim abroad has profound implications for China, its neighbours, and the rest of the world. Nearing the close of his first term, Xi’s world view has already left its mark on the domestic economy, with state companies further retooled and strengthened so they can hold their own against the dynamic, fast-growing private sector. At the same time, increasingly powerful entrepreneurs have been pulled into line. A number have been jailed; others have been told to drop overseas acquisitions. In late September, the party and the government issued a joint statement saying entrepreneurs should be not just professional, but patriotic as well. Parallel to the domestic political tightening is a significant increase in China’s clout abroad — diplomatically, economically, and militarily. The larger question of whether Xi’s approach will work in the longer term has, for the moment, been shunted aside. Having pledged to strengthen both the country and the party, for now, Xi towers over them both. Few close watchers of China, either at home or overseas, predicted Xi Jinping would stiffen the party’s control over the media, lawyers and the courts, and civil society groups when he took over as head of the Communist Party in 2012. Likewise, Xi confounded the broad consensus among China watchers that the era of strongman rule in China was over, replaced by a more consultative system appropriate for running a complex, modern state. Nor, with few exceptions, did the pundits foresee Xi’s willingness to take the kinds of risks in foreign and military policy that he has. In part, such assessments were the product of the wishful thinking that many in the West have long excelled at, the ever-recurring conceit that China would inevitably become more open and democratic as it became richer, and thus more amenable and friendly to Western ideas and interests. Author and journalist James Mann labelled this view, one held by many Western politicians and business leaders in the 1980s and 1990s, the ‘China fantasy’. Writing in 2016, a decade after the release of his book of the same name, Mann said that the ‘China fantasy’ got the dynamics exactly wrong. “Economic development, trade and investment have yielded greater political repression and a more closed political system” rather than the other way around. In truth, the disillusionment over Xi’s domestic crackdown fits a long-standing pattern. Hu Jintao, Xi’s predecessor, was considered an underperforming leader over his two five-year terms from 2002, with little fundamental commitment to either economic change or political reform. Hu was no democrat, yet in retrospect, compared to Xi, he oversaw a more open administration and, at different times, tolerated and encouraged activist lawyers seeking to defend anti-government clients. His premier, Wen Jiabao, talked in frank terms about China’s need for more democratic government, even if he had little inclination or ability to pursue it. When Hu and Wen were in power, however, they were dogged by the same criticism, that they were turning back the clock on political liberalisation, as Xi is now. Chinese liberals and foreign experts largely looked askance at Hu and Wen, and with nostalgia at their predecessors, Jiang Zemin, and his economic tsar, Zhu Rongji. Jiang and Zhu built close relations with the United States, oversaw a once-in-a-generation overhaul of bloated state industries, joined the World Trade Organization, and made room for adventurous policymaking by officials under them. But at the time, Jiang and Zhu were also judged harshly on their record of political reform. During the 1990s when the pair were in power, their critics looked back as well, this time at the 1980s as the high point of openness and democracy in China. During this first flush of reform, Chinese leaders sanctioned breathtaking economic change and encouraged discussion of political reform. It was an open era that came to a decisive and bloody end with the 1989 military crackdown on demonstrators in Beijing and throughout the country. Jiang took over as party secretary just before the 1989 crackdown and always stoutly defended it. The pattern is telling nonetheless. As China has become wealthier, its economy more open, and its society more complex, the ruling party and its leaders have moved politics in the opposite direction. Over time, the system has become less liberal and more confident in its disdain for Western democracy. China’s leaders have also worked systematically to maintain a core role for the state in business, while bringing private entrepreneurs more securely into the party’s fold. The costs for anyone who defies CCP rule, especially under Xi, have only gone up. Xi’s political personality does not by itself explain China’s trajectory. In 2012, Xi inherited a vastly different country from that which Hu Jintao had inherited a decade earlier. Xi took charge of a China that was the world’s second-largest economy; when Hu arrived in office, China was only ranked 6th. Moreover, by the time Xi came to power, the Chinese economy had sailed through the challenges of the country’s entry into the World Trade Organization in 2001, which many locals and foreigners alike had worried posed an existential threat to uncompetitive Chinese companies. Beijing also prospered during the global financial crisis of 2008–09 after the government flooded the economy with new bank loans. The debts incurred in the huge stimulus program may still come back to haunt Beijing, but at the time, the policy’s success, and the West’s evident failings, gave Chinese leaders a huge confidence boost in the strength and adaptability of the party system. Just as important is the fact that Xi inherited from his predecessors more than two decades of massive investment in the country’s military. Unlike Hu, Xi took charge of a People’s Liberation Army with restructured land forces, squadrons of modern jet fighters, a growing missile force, a navy with the capability to project power well beyond China’s immediate shores, and an expanded nuclear armoury. China’s ambitions for regional hegemony were played down under Deng Xiaoping and his predecessors to calm fears of a rising China among its neighbours and allow the country to focus on economic development. By the time Xi took office, China was more confident in its ability to press its claims, especially in the East China and South China Seas. In that respect, Xi’s more assertive foreign policy is not just a product of his personal world view or of rising Chinese nationalism. Xi has been a far more assertive and risk-taking leader than Hu in large part because he can be. One of the least remarked upon aspects of Xi’s rapid and ruthless accumulation of power is that he has accomplished this with only a few rusted-on allies on the peak leadership body, the Politburo Standing Committee. Xi is tightly aligned with just one person on the all-male seven-member body, Wang Qishan, the anti-corruption tsar. Although it is wrong to reduce elite Chinese politics to binary factional power struggles, it is true nonetheless that past leaders have often been constrained by their lack of support in the Standing Committee. Jiang Zemin, for example, took years to consolidate power, and then refused to give it up, even after he had ceded the position as head of the party to Hu Jintao. Hu, in turn, struggled, because he could never fully cast off the power and influence of Jiang and his allies. The key question for the upcoming party congress is the extent to which Xi gets his way and is able to take an iron grip on the Politburo by stacking it with loyalists. Central to this issue is whether Xi will stick to the emerging conventions that have guided the nomination processes for the past two decades. The first of these conventions dictates that Xi should nominate a clear successor in October to take over leadership of the Communist Party at the end of his second term, in 2022. The second is the practice known as ‘seven up, eight out’, according to which appointees to the Standing Committee should be no older than 67 years of age. Anyone aged 68 or older must retire. These two conventions are especially pertinent this year. By rights, Wang Qishan, Xi’s most trusted, and many would say, capable, colleague, who will be 69 by the time of the party congress in October, should retire. Xi, however, could buck recent practice and keep him on. Xi could also leave his own succession open, or position a number of competing candidates as potential successors. Whatever course Xi does take in October, he has given himself enormous flexibility in appointing members of the top leadership group. He could keep Wang Qishan on, for example, and also elevate some of his most trusted aides into positions beyond what their current level of seniority would ordinarily have dictated. Any decision to keep Wang could have far-reaching consequences. If Wang is reappointed, that may spell the end of Li Keqiang’s role as premier. Such a move could at least come with a face-saving veneer. Li could be moved to head the National People’s Congress, a position formally ranked in the past as number two in the Politburo, behind the party secretary. At the moment, the odds that Li will be forced to change jobs are low and falling. But few doubt that Li being moved on from his position as premier would be anything other than a demotion. The conventions for nominations and appointments to the Politburo are only relatively recent inventions, dating from the late 1990s. Further, the retirement rules do not, and have never, applied to the position of party secretary. Jiang Zemin didn’t retire as head of the CCP until he was well into his seventies. Zhu Rongji was appointed premier in 1998 at the age of 69. But the patchwork of evolving institutional norms, particularly those stipulating that any party secretary prepare the ground for his successor, have been widely viewed as one of the secrets of China’s success over the past two decades. Authoritarian systems have traditionally struggled, and often been consumed by, questions of succession. In a mark of its growing pragmatism and maturity, the CCP seemed to have resolved that issue. Xi, however, appears to have other ideas. He has prepared the way to return to the kind of system that prevailed in the 1980s and 1990s, of a more informal process, with no age limits, and governed by consultation with party elders, but which in practice leaves much power in the hands of the party secretary. If Xi does in fact go back to the future, then there is likely to be a backlash within the party. Xi’s opponents are impotent for the time being, such is his power and demonstrated willingness to use it. It is also true that it is difficult to chart in any clear fashion where or when opposition to Xi might be registered with any effectiveness. But the storehouse of enemies that Xi has accumulated in office is large. He has destroyed, and indeed continues to destroy, a large number of once-powerful and wealthy party fiefdoms in the industrial and financial sectors. The intelligentsia has been battered by his demands that they adhere to the prevailing line. Civil society has been cowed. Even mainstream policymakers have had to keep their heads down, lest they get on the leadership’s wrong side. It is difficult to see how all of these different actors in China’s increasingly complex political economy will remain mute and powerless in the longer term. In amassing power in the party and marginalising the State Council and the premier, Li Keqiang, Xi has taken his stylistic cues from previous Chinese autocrats. Both Deng Xiaoping and Mao Zedong used authoritarian powers to cut through multiple levels of party and government bureaucracies to force change. So too did Zhu Rongji, in his restructuring of the economy in the late 1990s and into the new century. The lesson that Xi has taken from past leaders is that autocracy is an essential weapon for any Chinese leader who wants to galvanise both the central party and government, and the vast far-flung bureaucracy, to get anything done. Xi seems to have concluded that the consensus, ‘first among equals’ style leadership of Hu and Wen was ineffective and easily parried by powerful interest groups, which blossomed under their weak stewardship. While Hu and Wen frequently diagnosed the economy’s problems with great perspicuity, they were not deft in addressing them. Likewise, ambitious Politburo members such as Bo Xilai, the princeling party chief of Chongqing, and Zhou Yongkang, the head of the police, intelligence and legal systems, built large personal and political empires in the first decade of the twenty-first century. Bo was detained in the final year of the Hu administration but it was left to Xi to clear out his two rivals’ vast network of cronies and commercial interests. After Zhou was arrested in late 2013, the authorities reportedly seized assets worth an astounding US$14.5 billion under his control, and that of his family and associates. Bo was convicted of corruption in late 2013. Zhou was convicted of corruption and disclosure of state secrets in mid-2015. Both men were sentenced to life in prison, verdicts which sent an unmistakable signal to Xi’s intra-party rivals of the potential cost of opposing his rule. From Xi’s perspective, the problem didn’t just reside in the two individuals, but in how they had managed to build such fiefdoms in the first place. The examples set by Bo and Zhou doubtless hardened Xi’s resolve to re-centralise power. Not only did Bo and Zhou represent a genuine threat to Xi’s position as head of the party; they also exemplified in Xi’s eyes, a danger to party rule itself. Xi and Wang Qishan have not slackened off in office, despite numerous predictions that their anti-corruption drive would gradually subside. At least 150 officials of vice-ministerial rank and above have been detained in the campaign, which has blended genuine anti-corruption efforts with political purges. In July 2017, just ahead of the 19th Party Congress, Sun Zhengcai, the Chongqing party secretary and Politburo member, was abruptly removed from office and put under investigation. Within the party, Xi’s decisiveness has produced striking outcomes. On the economy, Xi has made much less progress. Any CCP head possesses enormous leeway, especially when they manage to take hold of the party’s wide-ranging executive powers as Xi has done. Personnel changes in the military, an enhanced role for the anti-graft body, a reduced role for the premier and the State Council — all look from the outside to be tough, difficult and indeed daring decisions, which from a purely political perspective, they are. Xi’s command of politics also reflects his history within the party, and his standing within the inner-core of the leadership, the Politburo Standing Committee. But whereas Xi has the ability to make political decisions and force them through to achieve short-term outcomes, he cannot snap his fingers in the same fashion to force change in China’s vast, complicated, and globally integrated economy. Put another way, Xi’s autocratic style may help him in his ambition to strengthen party controls but it does not necessarily translate into effective economic policymaking. The argument in favour of greater party oversight and a cleaner CCP is that it will help to introduce further market reforms of the kind that Xi espoused soon after coming to office. Xi is ‘turning left to turn right’, to use a Chinese saying. In other words, he is using his first term to shore up his leftist base in the party, and then leveraging his accumulated political capital to strike out on a more liberal path — in Chinese terms, ‘turning right’. Supporting this argument is the fact that Xi hails from the market reform wing of the CCP. Xi’s father, Xi Zhongxun, a revered revolutionary, was a strong supporter of Deng Xiaoping, whose leadership built and entrenched the market economy in China, and spent his final years living in Shenzhen, the model incubator of modern Chinese capitalism. Xi also presided over Fujian and Zhejiang provinces at the time they became the provinces most identified with entrepreneurship and wealth creation. The idea that Xi is using an illiberal first term to consolidate his base within the party, with the aim of giving him greater flexibility later, is a neat, and for many Western observers, compelling theory. But it is one that does not fit with the policy priorities and belief system that Xi has displayed in office. Since becoming head of the Communist Party, Xi has focused little on the private sector, either in speeches or policy terms. Rather, he has sought to protect and consolidate the role of the state sector in the economy. For Xi, the private sector is an indispensable tool that, managed properly, will enhance the party’s power. Certainly, in China, as in many countries, leaders sometimes play to their bases before using their political capital for other ends. But in Xi’s case, it is not clear that party consolidation bodes well for further market reforms, whatever the sequencing may be. In fact, party consolidation instinctively pushes the leadership in a more conservative direction. Most obviously, re-anchoring party control of the economy inevitably means two things. The first is the consolidation of the state sector, which is well underway. Since 2012, when Xi came to power, the state firms’ share of investment and profits have risen relative to the private sector. The second is a further extension of the party into the private sector, which is also taking place. In Xi’s first term, the party has launched pilot programs in which entrepreneurs invest in state companies as part of an effort to reform them. In the process, the entrepreneurs are being drawn more tightly into the party system, incurring both costs and benefits. After decades of concealing the party’s role in both public and private companies, the CCP has also begun explicitly writing its role into companies’ articles of associations, to make its authority clear. Indeed, far from making extra space for entrepreneurs, Xi’s priority in the lead-up to the party congress has been to rein in some of the fastest-growing private companies. The People’s Daily, which remains the party’s official mouthpiece, put the companies into the category of ‘gray rhinos’, modern business shorthand for “obvious dangers that are often ignored”. In recent months, the party has singled out a number of ‘gray rhinos’, detaining some of their top executives, cutting off bank credit to others, and also investigating the impact of their products. The companies targeted include Anbang, an insurance company, Tencent, the internet giant, and Wanda, the global movies and entertainment behemoth. Partly, the crackdown is about financial prudence. The government, having encouraged Chinese companies to go offshore, is now worried about their debt-fuelled overseas acquisitions and the eerie echoes of Japan’s ill-fated foreign purchases in the 1980s. But the crackdown doubles as a power play, of the ruling party reminding these now huge private companies just who’s boss. The central government’s focus on reining in corporate debt is to be welcomed. But until now, Xi had consistently made handling the country’s addiction to debt for growth subordinate to the maintenance of growth itself. Debt is the economy’s weak spot, a bubble that will eventually burst unless it can be artfully deflated. Although the bursting of the bubble in various forms has long been predicted, the remarks of billionaire investor George Soros at an Asia Society event in April 2016 are nonetheless germane — that such bubbles usually last longer than most expect, only to take on a “parabolic” form towards their denouement, ensuring that they wreak widespread havoc when they do finally end. Economist George Magnus estimates that China’s debt to GDP ratio will exceed 300 per cent by the end of 2018. On this scenario, China’s economy is heading down the path of post-bubble Japan, of years of deleveraging and sub-par growth. If that is the case, the slowdown will take place at significantly lower levels of wealth per capita than Japan, with larger gaps in incomes between the haves and have-nots, and in a vastly more degraded physical environment and unsettled polity. In recent years, the debt issue has taken another dangerous turn. The holders of Chinese debt in the past, and during the last big bailout and recapitalisation at the turn of the century, were overwhelmingly large Chinese centrally owned state banks. That is no longer the case. The big four or five state banks, now all listed overseas, have become more disciplined about lending in the last decade. The largest growth in lending has come from smaller regional banks, which face much less supervision from Beijing and are funded in the short-term credit market rather than with their own deposits. Since all the banks, in one form or another, are state-owned, the government in the past could be relied on to step in — in effect, taking money out of one pocket and putting it into another. But the new factors, of both the growth in lending of smaller banks, and their unstable funding base, will make any bailout more complex and difficult to manage. The shadow banking sector (financial firms that exist outside of the formal banking sector) has expanded rapidly in recent years. The sector is less regulated, and the identities of the lenders and borrowers less clear. A future Chinese crisis could share some commonalities with the Western financial meltdown, which was caused not just by falling property prices but by the fact that the direct relationship between lenders and borrowers had been severed. Chinese lending is entering similarly opaque territory. In other respects, the outlook for the two economies — Japan at the start of the 1990s and China today — have much in common. In both countries, deep problems were hidden beneath the surface. Corporate Japan got caught in a debt trap — as companies deleveraged, the government had to increase its own spending and borrowing to fend off economic collapse. In the meantime, the governments in both countries failed to execute the kinds of reforms or recapitalisation of banks that could have returned the economy to growth at an earlier stage. China is still fundamentally an economy with lots of growth potential. Although it is the world’s second-largest economy, China’s GDP per capita is still way down global rankings, nestled between Mexico and Lebanon. But Beijing’s instincts are similar to those of Tokyo during Japan’s financial crisis: to prop up property prices; and to put off changes that would be disruptive to China’s iron triangle of the CCP, state-owned companies, and provincial, city and local governments. If that is the case, then the economy’s long-term growth potential will be substantially diminished, and Xi’s second term will be far more challenging. Aside from the state of the global economy, which has an impact on China in ways that Beijing cannot control, Xi faces other barriers to maintaining healthy growth over the longer term. By 2020, near the end of Xi’s second term, China’s population will be nearer its demographic tipping point. The demographic crunch will mean a narrowing of the tax base at a time of rising pension costs, and, without substantial productivity gains, lower output. China currently has more than 185 million citizens over the age of 60. The elderly now account for around 12 per cent of China’s population, a figure that is predicted to swell to 34 per cent by 2050. China’s working-age population has already started to shrink. By the turn of the decade, it will start to contract rapidly, with concrete impacts on the labour market, consumption, and pensions. The demographic dividend from the supply of young, cheap workers into the manufacturing sector has all but gone. Without large structural reform, the sorts of issues that Xi is grappling with now will become more intractable. Nevertheless, the prospects for the Chinese economy are not entirely negative. There are signs that the economic transition that the Chinese Government has for so long talked about — moving from a reliance on investment to consumption — is well underway. China’s old economy based on manufacturing and construction is weak, so much so that the government delivered a modest credit stimulus in 2017. But the broader trends are more positive. In 2016, consumption and services outpaced the old drivers of growth, manufacturing and investment, for the fifth successive year. For all of Donald Trump’s protestations about the influx of Chinese goods into the United States and other markets, net exports have not contributed to China’s GDP since 2007–08. Moreover, slowing headline growth numbers give a misleading impression, as the economy is growing off a far higher base. This year’s ‘slow’ pace of growth of about 6 per cent is off a base that is 300 per cent larger than it was a decade ago, when growth was around 10 per cent. Six per cent growth in consumption and services can easily produce more jobs than double that rate of growth based on an expansion of heavy industry and construction. The economy, like other institutions in Xi’s China, is both evolving and decaying, with no sign about which trend will prevail. Even if Xi gets his way at the 19th Party Congress, and stacks the Politburo with loyalists, it is difficult to say what policy changes will follow. With Xi already seemingly all powerful, what new initiatives will he want to pursue that he is now prevented from doing? The most favourable interpretation is the scenario canvassed above — that Xi is ‘turning left to turn right’. But aside from continued tinkering with state enterprise reform, there is little sign that Xi has any intention of going down this path of major economic surgery. Equally, Xi shows no sign of loosening party control in the political system. Every major political initiative he has taken in office has moved in the opposite direction. One interpretation of the path Xi has set the country on is debated only outside of China, and certainly not inside the country. It is a view of Xi that depicts him as a kind of rich man’s Brezhnev, the Soviet leader who presided over a lengthy period of “rigid state control and retreat from the modest promises of more liberal attitudes that flowered briefly” under his predecessor, Nikita Khrushchev. It might seem outlandish to compare the insular decrepitude of the former Soviet Union with China’s astounding success — thus far — in merging an authoritarian Leninist state with an ambitious, technologically advanced, entrepreneurial economy. To be sure, Xi’s China is not Brezhnev’s Soviet Union. Even so, Xi’s political hard line will have a cost at some stage, either in terms of the performance of the Chinese economy, or the revenge of the powerful interests in the party whom Xi has sought to destroy. Richard McGregor is an award-winning journalist and author with unrivalled experience reporting on the top-level politics and economies of east Asia, primarily China and Japan. He was the Financial Times bureau chief in Beijing and Shanghai between 2000 and 2009, and headed the Washington office for four years from 2011. Prior to joining the FT, he was the chief political correspondent and China and Japan correspondent for The Australian. His book The Party won numerous awards, including the Asia Society in New York award in 2011 for best book on Asia. His latest book, Asia’s Reckoning: China, Japan, and the Fate of US Power, was described as “shrewd and knowing” by The Wall Street Journal, and a “compelling and impressive” read by The Economist. He was a fellow at the Wilson Center in 2015 and a visiting scholar at the Sigur Center at George Washington University in 2016. He has lectured widely, in the United States and elsewhere, on Chinese politics and Asia. Bobo Lo, A Wary Embrace: What the China–Russia Relationship Means for the World, A Lowy Institute Paper (Melbourne: Penguin Random House Australia, 2017). Lucy Hornby, “Chinese Crackdown on Dealmakers Reflects Xi Power Play”, Financial Times, 10 August 2017, https://www.ft.com/content/ed900da6-769b-11e7-90c0-90a9d1bc9691. Ting Shi, “China Signals Patriotism as Key Expectation for Entrepreneurs”, Bloomberg, 26 September 2017. James Mann, “America’s Dangerous ‘China Fantasy’”, The New York Times, 27 October 2016, https://www.nytimes.com/2016/10/28/opinion/americas-dangerous-china-fantasy.html. Matt Schiavenza, “Was Hu Jintao a Failure?”, The Atlantic, 13 March 2013, https://www.theatlantic.com/china/archive/2013/03/was-hu-jintao-a-failure/273868/. “Portrait of Vice President Xi Jinping: ‘Ambitious Survivor’ of the Cultural Revolution”, WikiLeaks, 16 November 2009, https://wikileaks.org/plusd/cables/09BEIJING3128_a.html. Alastair Iain Johnston, “Is Chinese Nationalism Rising? Evidence from Beijing”, International Security 41, No 3 (Winter 2016/17), 7–43, http://www.mitpressjournals.org/doi/pdf/10.1162/ISEC_a_00265. “Will Xi Bend Retirement ‘Rule’ to Keep Top Officials in Power?”, Bloomberg News, 1 November 2016, https://www.bloomberg.com/news/articles/2016-10-31/china-official-says-party-has-no-set-retirement-age-for-leaders. Personal conversations in China in late 2016 and mid-2017. Christopher Johnson, “Chinese Politics Has No Rules, But it May Be Good if Xi Jinping Breaks Them”, CSIS Report, 9 August 2017, https://www.csis.org/analysis/chinese-politics-has-no-rules-it-may-be-good-if-xi-jinping-breaks-them. Benjamin Kang Lim and Ben Blanchard, “China Seizes $14.5 billion in Assets from Family, Associates of Ex-Security Chief: Sources”, Reuters, 30 March 2014, http://www.reuters.com/article/us-china-corruption-zhou/exclusive-china-seizes-14-5-billion-assets-from-family-associates-of-ex-security-chief-sources-idUSBREA2T02S20140330. Nicholas Lardy, “The Changing Role of the Private Sector in China”, in Iris Day and John Simon (eds), Structural Change in China: Implications for Australia and the World (Sydney, Reserve Bank of Australia, 2016), http://www.rba.gov.au/publications/confs/2016/. Jennifer Hughes, “China’s Communist Party Writes itself into Company Law”, Financial Times, 15 August 2017, https://www.ft.com/content/a4b28218-80db-11e7-94e2-c5b903247afd. “What’s a ‘Gray Rhino’ and Why Did it Cause Chinese Stocks to Drop?”, CNN Money, 17 July 2017, http://money.cnn.com/2017/07/17/investing/china-stocks-gray-rhino-crackdown/index.html. Eric Fish, “George Soros: ‘Eerie Resemblance’ between China Now and Pre-Financial Crisis US”, Asia Society, 22 April 2016, http://asiasociety.org/blog/asia/george-soros-eerie-resemblance-between-china-now-and-pre-financial-crisis-us. Douglas Elliott, Arthur Kroeber and Yu Qiao, “Shadow Banking in China: A Primer”, Economic Studies at Brookings, March 2015, https://www.brookings.edu/wp-content/uploads/2016/06/shadow_banking_china_elliott_kroeber_yu.pdf. World Bank, GDP per capita (current US$), 2016, https://data.worldbank.org/indicator/NY.GDP.PCAP.CD?year_high_desc=true. “Early Look: China First-Quarter Growth to Stay Strong After Stimulus Spree”, The Wall Street Journal, 10 April 2017, https://blogs.wsj.com/chinarealtime/2017/04/10/early-look-china-first-quarter-growth-to-stay-strong-after-stimulus-spree/. Andy Rothman, “A Transition Well Underway”, Matthews Asia, 15 July 2016, https://us.matthewsasia.com/perspectives-on-asia/sinology/article-1147/default.fs. W Raphael Lam, Xiaoguang Liu and Alfred Schipke, “With China Slowing, Faster Reforms Critical to Generate Jobs”, IMFBlog, 16 September 2105, https://blogs.imf.org/2015/09/16/with-china-slowing-faster-reforms-critical-to-generate-jobs/. Philip Bowring, “Is Xi Jinping China’s Brezhnev?”, Asia Sentinel, 28 January 2014, http://www.asiasentinel.com/politics/xi-jinping-china-brezhnev/.